Possession first emerged in 1981, and so it wasn’t long before, in the UK at least, it was grouped into the Video Nasty mass category by critics with no understanding of what the film was all about, and banned. This is not so much a horror movie as an exploration of the human psyche. There are plenty of violent scenes. No one stands or sits still for a moment. The whole thing is driven by extreme emotions, the main characters living life on the edge of madness, with Anna almost certainly crossing over. It’s uncomfortable to watch, to the extent you wish for a better life and a semblance of normality for Mark with his boy’s teacher – an event which, although more than hinted at, is never quite seen through. The location shoots are filmed against a backdrop of German urban sprawls. I think I’m correct in saying this was director Andrzej Zulawski’s one and only English language film. Ironically, while the UK and America didn’t get it, France lapped it up. At the Cannes Film Festival it was nominated for the Palme d’Or. But more significantly Isabelle Adjani won Best Actress for her portrayal of Anna. This is not surprising, as her performance is rather astonishing. The manner in which she flails around in the subway, like an escaped loon from Arkham Asylum, which culminates in her having a miscarriage of disgusting fluids, will have you believe she is truly unhinged. A young-looking Sam Neill also puts in a sterling performance, but not quite to the same level. There are a number of Blu-ray extra features for film collectors: There are commentaries from the director, and Frederic Tuten who co-wrote the script; a director interview; an interview with the composer Andrzej Korzynski; an interview with producer Christian Ferry; a trailer; and a making-of documentary. 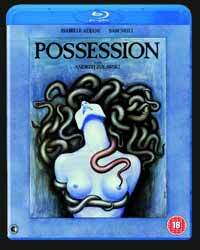 Basha is a featurette on the film poster artist; the poster for Possession represents both evil and eroticism – a sort of return to the corruption in the Garden of Eden. Repossessed describes the film’s handling by the Video Nasty censors in the UK and the way it was cut to ribbons and had demonic dialogue added to make it conform to a more stereotypical horror format in the US. This is a very well made film, with excellent performances and some worthy disc extras. However, it’s not the sort of film I enjoy watching that much. My favourite film critic Mark Kermode called it an unsung masterpiece. He’s right in the same way The Exorcist is a masterpiece but, they are not necessarily a fun viewing experience.